, but until now, trees have largely been missing from the landscape of our product. Trees have been modeled individually in a handful of locations, such as Disney World and the Eiffel Tower, and we’ve learned from those instances to make sure we could represent trees in a realistic way that could scale to places where trees exist en masse, like urban parks and large forests. Over time we’ve developed a way to produce highly detailed, photo-textured versions of specific tree species and reproduce them at large scale. In the new release of Google Earth 6, people in several cities will now be able to browse 3D trees in some of their favorite parks, and maybe even pick out a spot for their next picnic! Our urban tree coverage includes San Francisco (downtown and Golden Gate Park), Chicago (Grant, Millennium and Lincoln Parks), New York City (Prospect and Riverside Parks), Athens (Thiseio Park, the National Gardens, Lykavittos Hill and around the Acropolis), Berlin (Tiergarten Park) and Tokyo (Yoyogi Park, Shinjuku Gyoen and the Akasaka Imperial Grounds). Prospective students can even scope out the beautiful greenery on campus at the University of California, Davis. With 3D trees in Google Earth, we’ve brought characteristic trees to life, from the palm trees that dot San Francisco's bayfront Embarcadero Street, to the olive trees that cling to the Acropolis in Athens, to the flowering dogwoods found in Tokyo’s parks. All told, there are around 50 different tree species to explore in Google Earth and counting! Of course trees also grow and flourish outside of cities. In fact, urban trees only make up a very small percentage of the estimated more than 400 billion trees on our planet. In order to tell the greater story of trees on our planet, we worked with several environmental organizations to model reforestation projects and protected forests in Google Earth. Working with Nobel Prize winner Wangari Maathai’s Green Belt Movement, we modeled five tree replanting sites in Kenya. These sites represent just a small part of the Green Belt Movement’s work planting more than 40 million trees to restore the environment and improve the lives of people who are linked to the land. We also worked with the Surui people, an indigenous group in the Amazon who are working to protect their rainforest from illegal logging. The Surui and one of their partners, the Amazon Conservation Team, selected some of their most culturally significant trees, including the acai palm and the cashew tree, to be modeled for this project. The resulting 3D visualization enables Google Earth users from all over the world to experience the magic of the Amazon rainforest. Our third partner, CONABIO, supports and protects Mexico’s biodiversity through an ambitious forest monitoring project that tracks changes in forest health and cover over time. This project has helped define priority forests that need urgent attention and protection, like the two mangrove forest areas that we’ve modeled in Google Earth. These forests that hug the Mexican coastline provide unique habitats for wildlife animals like crocodiles and jaguars that depend on these sensitive ecosystems to survive. This first release of 3D trees in Google Earth includes more than 80 million trees to study and explore. But we’re not content to rest on our virtual laurels, so look out for trees in more cities and forests soon! 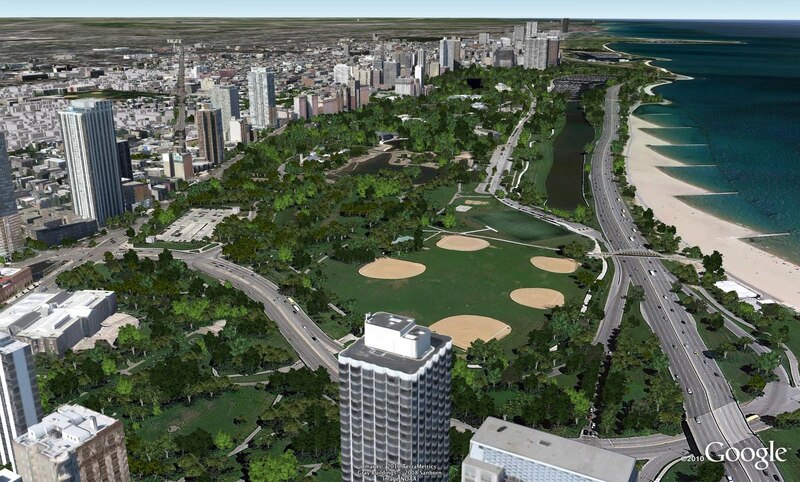 To start exploring 3D trees in Google Earth, first download Google Earth 6. Then explore our tree showcase, where you will find links to tours of trees in San Francisco, Tokyo, Athens, the Surui forest, and more. We strive to provide as much realism as possible in Google Earth, but until now, trees have largely been missing from the landscape of our product. Trees have been modeled individually in a handful of locations, such as Disney World and the Eiffel Tower, and we’ve learned from those instances to make sure we could represent trees in a realistic way that could scale to places where trees exist en masse, like urban parks and large forests.